Arriving off the train at the magnificent Victorian pile of the Central Station, it’s cold and threatening the heavy rain that comes, sure enough, the next day. Newcastle-Upon-Tyne has many virtues but the weather isn’t one of them, although the large wind farms north of the city in Blyth benefit from that coolness, as does HP’s free-air cooled datacentre in Wynyard, County Durham. Perched imposingly above a mighty river, adorned by superb architecture and offering easy access to superb beaches and countryside, it’s a wonderful place in many ways but you couldn’t mistake it for California’s Silicon Valley. And yet Newcastle, occupying England’s top-right hand corner and better known for its industrial past of coal, steel and shipyards, is building a significant commercial hub with technology at its heart. Dynamo 14, a one-day conference organised by local business groups in early May, attracted 350 delegates who heard about what the area offers for technology companies considering investments in an area that is traditionally among the poorest in the country, having seen its heavy industries decline and sag. Most surely doubted the notion that Newcastle or the wider north-east region — often characterised by the national media as a place of boarded-up high streets, crime and poverty — could play host to another Valley. But there are good reasons for Newcastle having more chance than most in developing a strong community of digital entrepreneurs and innovators. Of course, there are tech hubs emerging all over the world. Take your pick from London, Berlin, Paris, Barcelona, Malaga, Dublin, Helsinki, Moscow, Istanbul and Belfast in Europe alone. And Newcastle, already has a platform. Accounting and business management software giant Sage, the UK’s largest technology firm, is based there. HP and Accenture also have significant bases locally, as do games makers like Ubisoft Reflections and CCP. The UK’s tax authority HMRC is building a Digital Delivery Centre to make it easier to collect taxes. 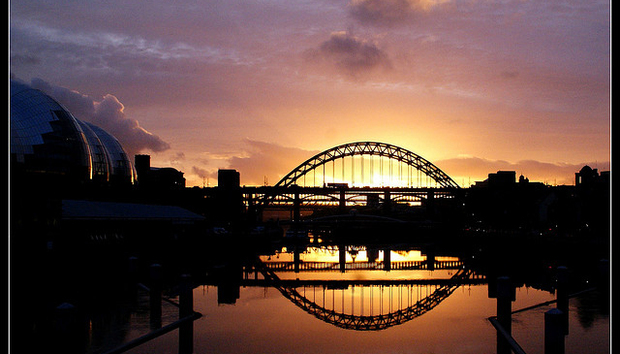 Red Hat Software has its biggest team of JBoss middleware developers in Newcastle. The UK’s largest office park, Cobalt Park is nearby and it hosts datacentres and Accenture’s North East Delivery Centre. Sunderland Software City, in the north-east’s second-largest city, supports another local cluster and there are five universities to provide talented employees: Newcastle, Northumbria, Durham, Sunderland and Teesside. “It’s breath-taking how many jobs there are in the region and there are 2,000 roles to be filled this year,” says Charlie Hoult, a local entrepreneur who chairs regional promoter and event organiser Dynamo and runs the Hoults Yard business village in Ouseburn on the banks of the River Tyne. Call it northshoring or even (punning on the locally set version of reality TV Jersey Shore and Newcastle natives’ nickname of Geordies) ‘geordieshoring’, but Hoult is optimistic that the area can attract new talent and large firms to relocate there. The conference was led by him and he convincingly makes a case for his home region, pointing to the quality of life, low cost of living, academic tradition and strong sense of community the region enjoys. Certainly, Newcastle has strengths to draw on: a skills base, strategic transport hub, developing arts and culture scene and a famously teeming nightlife. Symbols of change abound. The brewery that once sent out thousands of bottles of Newcastle Brown Ale daily is now becoming a cloud computing research centre. Companies like Newcastle-based Opencast Software are mining new seams of data rather than coal. There’s no shortage of people attempting to build a new Newcastle. Business voucher schemes capitalise on superfast broadband that’s coming to the city. Free training workshops advertise the advantages of a strong online presence for small businesses. For a local conference in what is sometimes depicted a region hermetically sealed, there are many at the Dynamo14 event who hail from other parts and provide interesting perspectives. Steve Caughey, CEO of cloud service federator Arjuna Technologies, is originally from Northern Ireland and he contends that Newcastle has to make the most of new opportunities. Herb Kim, a digital conference organiser from New York who now splits his time between Gateshead and Liverpool, notes the “amazing passion” of the region. However, he believes that for both the north-east and the UK as a whole, the Irish model of financial incentives is needed to encourage companies to do more research here and create long-term, high-value jobs. Bob Paton, a passionate local man who now runs Accenture’s service delivery operations in Newcastle, sees low cost and quality of life as key advantages. Nobody underestimates the challenges and shortly after the conference characterised by manifest optimism, The Guardian newspaper published a relentlessly downbeat article comparing the north-east to Detroit —although the article’s author doesn’t note that Detroit is also fighting hard to ride the digital wave. For cities battered by economic change, looking towards intellectual capital and the amazing changes wrought by the digital world is just common sense. The north-east’s former glories were built not just on muscle but engineering brilliance and the binary economy gives it the opportunity to come again with another form of engineering just as capable of changing fortunes and demographics. Charlie Hoult is surely right to say the area should be bullish about the attractions that already make the north-east a surprisingly (to outsiders) techie area, rather than placing its faith purely in inward investment schemes and other carrots. “We need to lead, not plead,” he says.